The whole notion is misconceived. Heat at the ocean surface is flowing the other way (balanced by SW). The IR flux upward exceeds the downward flux. Of course, the ocean does radiate thermal IR. Seen from space, etc. Any notional difficulty about absorbing IR would apply equally to the upward IR. There isn’t any. Yes, IR radiative transfer ceases within a few microns. But conductive transport is effective over longer distances, and beyond that, turbulent advection takes over. Heat flux occurs over the phase boundary with no great temperature gradient. I think the “argument” as it goes isn’t that the ocean doesn’t have absorptivity or emissivity at these wavelengths – just that the heat absorbed “because it is in the top micron” **therefore** goes into evaporating the top layer. But that’s the misconception – the top layer is losing, not gaining heat. It emits. And it doesn’t freeze. The down IR just makes up some of the heat the top layer is losing by radiating. The rest comes by conduction and advection from below, with no great difficulty. An interesting and well researched article. Firstly I’d like to know what evidence Nick has that the surface of the ocean emits IR rather than the molecules of water vapour just above the surface. If he thinks both the surface and the water vapour are emitting IR then I’d like to know the proportions of each. Secondly, how does he propose that downward IR goes about “making up the heat”. We know it can’t penetrate the surface much beyond it’s own wavelength. We also know that the thermal conductivity of water is very poor. We also know that turbulent mixing in wave structures takes place mostly further down inside waves, well beyond the distance IR gets to. “2. Forced convection – in the atmosphere from wind action; in the ocean from circulation and wave action”. I’ve put a a post on my website which may make it clearer. It shows the temperature gradients in the top surface layers. In the last mm the gradient, day and night, is negative upward, indicating that the hrat flow is upward. So, evidence that the surface emits the IR – wherever the IR is emitted from, heat has to reach it from some source, and this is mostly the lower depths (where the sunlight was absorbed). If the IR was emitted from vapor above, how does the heat get there to keep the vapor from cooling? Downward IR “makes up the heat”. The length scale for absorption is the same as the scale for emission – comparable to a wavelength. Heat is being removed by emission, and created by thermaiisation of downwelling IR. The two processes must add. I didn’t see the definition of convection in your link – is it in the comments? But I’m referring to turbulent transport by advection in eddies. The eddies are forced by ocean motions generally, and particularly wind stresses near the surface. They scale down towards the surface, but are quite adequate to convey the upflux of heat which is radiated, and would be also capable of conveying a similar downflux, although that rarely arises. I’ve only recently found your blog and am impressed by its calm tone and attention to detail. I’m also fairly new to the subject matter; for a newcomer like me a statement like “The energy in wavelengths greater than 4μm is less than 1% of the total solar energy and conventionally, we call solar radiation shortwave.” could give rise to confusion. I would feel less liable to confusion if radiation was classified according to the nature of the waves (infra-red/visible/ultraviolet) rather than according to their source. 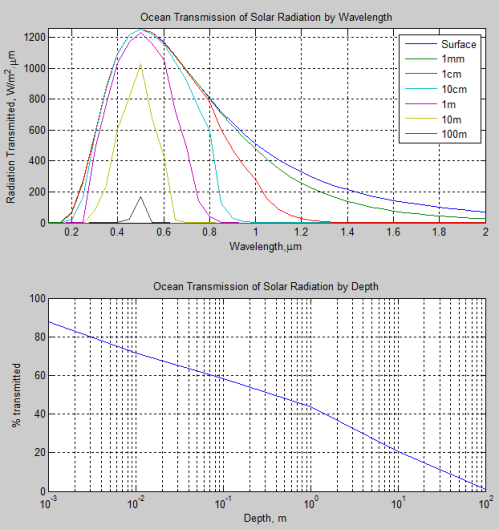 Is solar infrared radiation negligible (as compared with, say, terrestrial or atmospheric infrared)? Is it, like light, also described as short-wave? Perhaps I need a glossary of these overlapping usages. I spent months of confusion wondering what people meant by ‘top of the atmosphere’. Sometimes they seemed to be referring to the tropopause. You are right that the terms in the field can cause confusion. I could have been more clear. After repeating the subject matter too many times, I focus less on it.. 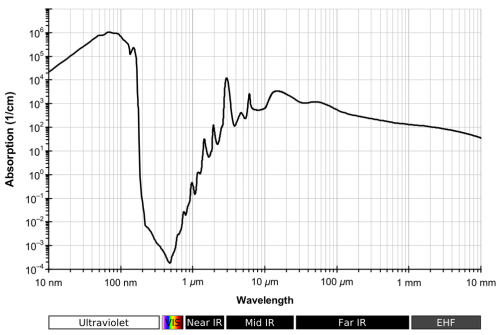 Solar radiation is divided between visible and infrared radiation – but only because infra-red is radiation > 0.7um, ie the invisible radiation. Which is why we use “shortwave” (greater than 4um) as a term because “IR” overlaps both solar and terrestrial radiation. Shortwave and longwave delineate solar and terrestrial radiation – by convention. If you check out the article link above the reason why the convention is useful should become clear. 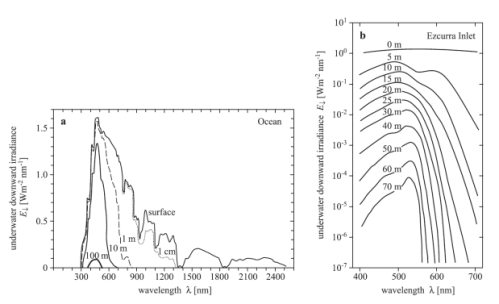 From Kirchhoff’s thermal radiation law, the emissivity of any given ocean layer at a given wavelength is the same as absorptivity. 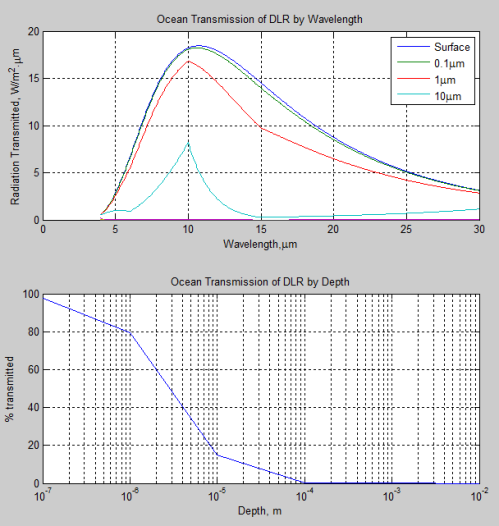 So ScienceOfDoom’s discussion above about absorption of downwelling atmospheric radiation of different wavelengths by the ocean applies equally well to *emission* of upwelling radiation to the atmosphere from the ocean. If the temperature of that given ocean layer is higher than the effective atmospheric temperature associated with the downwelling radiation, then the emitted radiation from that layer will be greater than the absorbed radiation, and the net flow between ocean and atmosphere will be from ocean to atmosphere, cooling off the ocean slightly. The effect of the absorption of downwelling radiation is best viewed as, the same as for land surface, a *reduction in the rate of cooling* via radiation. 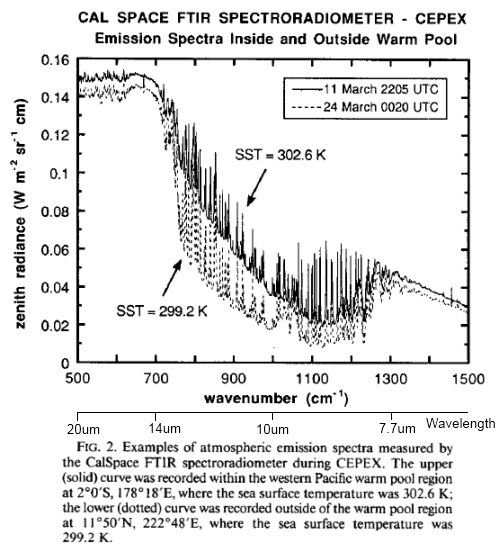 If the temperature of the ocean layer is less than the effective atmospheric temperature (likely only for limited wavelength ranges where atmospheric absorption and emission is high enough so the emission comes from low altitudes that really are warmer) then the absorption will be greater than emission, and the downwelling radiation from the atmosphere will warm the ocean. Neither case is particularly mysterious, I would think. It appears to me the difference between what Nick and Science of Doom say is in fact related to that dull point made in Note 1 (definition of heating). The back radiation does exist but the the net radiation balance can be up or down depending on if the air is cooler or warmer than the water. Generally the water is warmer, so on the average the net radiation flux is water to air. Energy is transported either up or down by conduction driven by convection by the air water boundary depending on which is hotter, but energy is always transported up into the air by evaporation. I don’t necessarily agree with Nick that the top surface is always cooler than the immediate layer below. If humidity is near 100%, the net evaporation rate goes to near zero. In addition the air may be so close to the surface temperature that net radiation flux is near zero. In that case, absorbed solar radiation may make the top surface the warmer layer. The reason for expecting a negative upwards temperature gradient at the surface is based on steady state flow balance. If you think of the top cm layer, an average 235 W/m2 passes through as SW. This does not interact with the temperature gradient (as a flux). Almost all of it has to pass back to the atmosphere. In this cm layer, it is conveyed by conduction or turbulent advection. Both cases require a temperature gradient. It’s true that there will be times when the atmosphere is unusually warm and the surface flow is reversed. My main point is that if the flow can go one way without huge temp differences, it can go the other. I’ve put on my blog some diagrams from an oceanographer showing day/night temperature profiles. …..”Some people get upset if we use the term heat”….. Yes, they are old fuddy duddies, who cant get with the free and easy, make it up as you go along, climate scientists. These people are so misguided as when they see the blog title “Science” they assume that a word like heat will be used properly. The general public don’t know any better than to describe the weight of a bag of sugar as 2Kilograms. Should we follow their example? What about sticking to phlogiston, we all know what they mean, don’t we? Actually it’s just pointless debating the meaning of a word rather than the substance of the physics. Your choice is to try and prove physics wrong by debating a word. No doubt the six books written by experts in the field of heat transfer – see Amazing Things we Find in Textbooks – The Real Second Law of Thermodynamics – will not convince you, and in return you will not offer a shred of proof. You will offer a mantra. Or, a raven. You will never be in a position to debate “the substance of the physics”…..if you are confused about the definition of key words like “heat”. BryanI’m actually very clear about the meaning of the word heat. But I choose to avoid a semantic dance with people who don’t understand physics – because it doesn’t accomplish anything. I look forward to your explanation of why so many experts in heat transfer disagree with your understanding of physics. Semantics games will probably be your best bet. …..”BryanI’m actually very clear about the meaning of the word heat.”……. Well perhaps you could give us your clear definition! scienceofdoom, a very well researched article. And Nick Stokes, your piece is interesting as well. I approach this as someone who surfed and dived (both day and nigh) for a couple of decades in the deep tropical ocean. Now, the human body is a marvelous instrument, capable of detecting temperature differences. 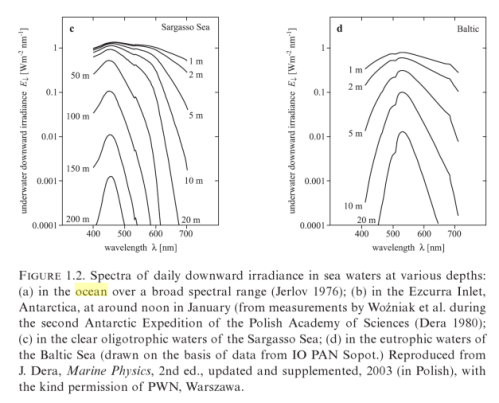 So I am very familiar with the thermal structure of the upper ocean, but not as curves on a graph. I know its structure because I have spent a lot of time there. Nick, you are right that there is a “hook” in the temperature curve. The surface is radiating and evaporating, so perforce it is cooler than the immediate substratum. However, that “hook” is a slight drop from the higher temperature that is found just below the surface. And that temperature is the temperature that is affected by the DLR. Yes, some of the energy in the immediate subsurface moves downwards. It does this by turbulence. However, that downwards motion through turbulence is opposed by the thermal stratification of the ocean (daytime) and also by the thermal circulation of the ocean (nighttime). As a result, a larger percentage of the DLR energy that is absorbed just below the surface gets re-radiated or evaporated than is the case with solar energy which is absorbed at depth. How much more? Aye, there’s the rub … As you know, the ocean is the opposite of the atmosphere. The atmosphere stratifies at night, and overturns vertically during the day. The ocean, on the other hand, thermally stratifies during the day, and overturns at night. This is also the time when both radiation sources are active. The solar radiation heats the bulk, and the DLR heats the skin. Both contribute to the increased loss due to convection, conduction, and evaporation. During the day, the DLR pushes the peak surface temperature way higher than it would be if it were just heated by the sun. It is quite perceptible when swimming in the tropical ocean on a warm day with no wind. Sometimes I’ve been swimming in very warm water, and when my arm goes down vertical the warm water stops at about my forearm. Lie still in that water, and you can feel how warm the very surface is driven by the combination of DLR and solar energy. At night, the surface cools below the temperature of the underlying layers. This soon starts vertical thermal circulation, and we get an entirely different situation. Slow upwelling begins over large areas, with interspersed smaller areas of faster-descending columns of cooler water. Of course there is no sun at night. All of the DLR which is entering the ocean is on a one way circulation path. It is absorbed immediately below the surface. It then moves upward (not downward) and radiates, conducts, and evaporates its energy upwards. Thus cooled, the water then sinks in the descending column. So at night, one effect of the DLR is to slow the vertical circulation of the ocean. Is there an overall conclusion? My only conclusion is that more of the DLR energy ends up quickly re-emitted upwards (whether by conduction, convection, or evaporation) than happens with the corresponding solar energy. Particularly in clear tropical waters, much of that energy enters the ocean at tens of metres of depth. A much smaller percentage of the solar energy is quickly re-emitted back upwards into the atmosphere or to space. Thanks for your comments here. My interest in the profiles is not so much the temperatures themselves, but what they say about fluxes. The “hook”, or maximum, must be associated with a heat source, which is the absorbed sunlight. That’s why it has to go away at night. We know it’s a source, because heat flows away in both directions. I think it’s interesting that the temperature variations, though not huge, are in the range of 1-2C, which I’m sure could be felt, as you say. There’s always a chicken-egg aspect to reasoning about heat fluxes and temperatures. Temperature gradients induce fluxes, but heat is conserved, so fluxes have to be continuous, and so force temperature gradients. But at surfaces, you often need to think first about temperatures. A downward IR flux, say, does not of itself force surface evaporation, or indeed upward IR emission. Those depend on surface temperature. The temperature has to settle at a value which will bring the fluxes into balance. That’s why there is that steep gradient drop near the surface. It doesn’t look steep in the diagram, but it is if you allow for the compressed depth scale. The steepness reflects the larger thermal resistance in the top mm and the 235 W/m2 flux that must pass through (because of insolation). The gradient would be steeper, and the surface colder, if it were not for the downwelling IR. I know that’s not all strictly in response to your comment, but you started me thinking about it. Thermodynamics classifies energy under two categories: work and heat. Heat is defined as any spontaneous flow of energy from one object to another, caused by a difference in temperature between the two objects. Work is defined as any other transfer of energy into or out of a system. E.g. pushing on a piston, stirring water, electrical current through a resistor. When work is done on a system we don’t say the system is being heated because the flow of energy is not a spontaneous one caused by a difference in temperature. Heat always flows from the higher temperature object to the lower temperature object. When various examples of Heat Engines are given in textbooks they ALWAYS show the engine as working between two reservoirs. Heat is always taken from the higher reservoir some work is done and the unused heat transferred to the lower temperature reservoir. Nobody has tried the insane idea of the engine working by taking thermal energy from the lower temperature reservoir,doing some work, and then transferring the unused heat to the higher temperature resoirvior. Yes… and if you increase the “heat” (pressure whatever) of the exhaust reservoir, it effects the amount of work your engine can do… If you have an engine exhausting into a perfect vacuum, your engine will run A LOT more efficiently than at 1bar 300k… you seem to be implying, that it would make no difference? As Tcold goes down e goes up. It’s true because the net flow of heat is always from the hotter to the colder. Strictly speaking that is not the definition of heat. That is a characteristic of heat. It would be insane to try that because it doesn’t work. Over in the article Amazing Things we Find in Textbooks – The Real Second Law of Thermodynamics you have the opportunity to state what you think about the specific point of disagreement – rather than random stuff that everyone does agree on. No doubt you will avoid the real question – does a hotter body absorb radiation from a colder body? You will avoid it because the experts in the field say “yes it does” and you say “no it doesn’t”..
Back radiation doesn’t heat the ocean, as the energy transfer is not caused by a difference in temperature. I tend to agree with what Leonard said under the other post, that it is probably better to avoid the use of “heat” in such a context. While I understand what you mean with it here, but it can be somewhat misleading and thus a pointless complication for understanding the subject. To sum up – I think it would be better to avoid saying that back radiation is “heating” the ocean. Ive got a random Q… ok so with water being totally opaque to LW, it is ignored as a transfer mechanism through a body of water… im assuming because LTE would make it irrelevant, now with turbulent mixing, basically working to greatly increase the surface area of say a warmer flow with a colder body of water, is the subsequent enhanced energy transfer partly due to radiative transfer as well as conduction in a fluid? you can’t really distinguish between radiative transfer and conduction within a near-opaque medium. With high opacity radiative transfer obeys a similar equation – the Rosseland regime. Any experimental measurement of conductivity will include it. But if you kinow the absorption coefficient you can calculate it the IR component of transfer. It will probably be very small. Thanks Nick, i realize it is a bit o a silly Q, just wanted to be sure ive got the mechanics right in my mind. Mike, No, it’s not a silly question – for more transparent substances it would be a real issue. It’s just that for something as opaque as water on a macroscopic scale, the IR component of internal transfer can’t be detected externally. You don’t give up, Doug, do you. Where is Archimedes? Warmer water (say, above 4 C) tends to buoy upwards…. Only if the water above it is colder and denser. But it isn’t. Temperature decreases with depth. Also, the density change with temperature is different with the sea water. The density doesn’t start to decrease at 4C like it does with pure water. Density also increases with pressure, i.e. depth. The density of sea water increases with depth while its temperature decreases. 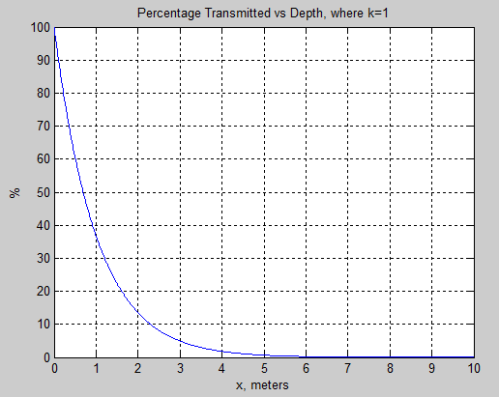 The density of sea water at a given depth decreases as its temperature increases, or it increases as its temperature decreases (not below its anomalous maximum density). Hence, water being warmed up at a given depth by thermal radiation (from above) will rise because its density decreases and because the density of water above it is a bit higher. on June 22, 2018 at 6:01 pm Mike M.
I do not see the point of this cryptic statement. ben dussan wrote: “The density of sea water at a given depth decreases as its temperature increases, or it increases as its temperature decreases (not below its anomalous maximum density). No, the density at a given depth decreases as its temperature increases, at all temperatures. There is no density maximum for seawater, at least not in the temperature range encountered in the ocean. Only if it becomes less dense than the already warmer water above it. Or if it is pushed upward by ocean currents. The weight of ocea water is dependent of temperature and salinity. Temperature inversion is a known phenomenon. There can be a cold freshwater lid over warmer ocean. This can prevent ice from fast melting and can be an explanation of slow melting during parts of ice ages. Heating by solar radiation decreases with depth. You can’t heat water at lower depth from solar radiation more than the water above it is heated because less energy is available to be absorbed. Note that the temperature in the upper few hundred meters is nearly constant. That’s because the near surface layer is relatively well mixed by turbulence caused by wind and waves. Solar radiation is not significant below 100 meters depth, less if there are significant quantities of particulates present. Ben: You are correct that warmer water tends to buoy up. Technically, less DENSE water tends to rise and that must be coupled with denser water sinking somewhere else. Density is a function of both temperature and salinity. Although the density of pure water rises as it cools below 4 degC (expanding on its way to becoming ice), the temperature at which ocean water has maximum density is 0 degC and the freezing point is -1.9 degC. The ice that forms on top of the ocean is mostly salt-free, not frozen salt-water. The temperature of surface ocean water depends on heat exchange via radiation, evaporation (latent heat) and conduction (simple heat) and the salinity depends on evaporation, precipitation, and influx of fresh water (near coasts and melting sea ice). Vertical transport depends on more than density. IIRC, the spinning of the planet causes water to pile up and subside on the western side of ocean basins and deep water to upwell on the eastern side. Winds also cause uneven sea surface as do some other phenomena.